When my ten-year-old son is excited, he flaps his hands like a limp-wristed seal. He makes the same move when he’s happy, or when he’s being ironic, or when he’s delivering the punch line of a joke. It’s the kind of gesture that can be endearing or annoying—depending on how many times it occurs in a given conversation—but it always fills me with a sense of pride. In a culture that allows boys such a narrow range of expression, I’m pleased to be raising a son who talks with his hands. Still, there have been many times when I’ve locked eyes with my spouse above our flamboyant flapper. How long, we wondered silently, before someone rains on this hand parade? There was a time when I was more optimistic. 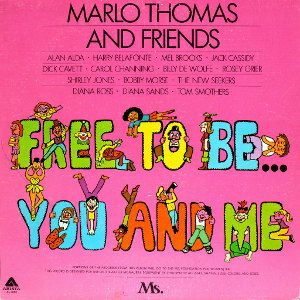 When Waylon was three, I introduced him to the soundtrack of my own childhood, Free to Be You and Me, but I purposely skipped the classic “William Wants a Doll.” Waylon didn’t yet know that boys who played with dolls were called sissies, and I didn’t want to introduce what I hoped were outmoded ideas. It didn’t take long before Waylon’s peers proved me wrong. Even though he attended the most progressive preschool in town, a place where boys and girls alike wore nothing but briefs and body paint through much of the summer, he still caught flack. Other kids reacted in horror when he wore pink clothes or painted his toenails or carried an orange backpack with a peace symbol. Katy and I searched for a way to help him think critically and stay safe in his social world. We explained that some families have very different rules for what boys can do and what girls can do. Some parents enforce these rules very strictly because they’re afraid of being different. I’m not sure he ever uttered those words, but our talks seemed to make him feel better, and he loved to come home with exasperated stories about the gender stereotypes he encountered. “Did you know that some people think boys are not allowed to like the color purple?” he’d ask over dinner, rolling his eyes. Given his critical perspective on gender expectations, you might think that he would be a bit of a rebel. But Waylon didn’t like to rock the boat. When he encountered resistance, he tended to retreat. By first grade, he wasn’t wearing pink shirts or painted nails. I thought maybe he had too much at stake, being a kid with queer parents. Maybe he just didn’t want to deal with social hassles, or maybe those things just weren’t part of his evolving identity. Then the flapping emerged as a major feature of his conversational schtick. It seemed so undeniably Waylon, such an expression of his personality, but I wondered if he’d retreat from that too, once he realized how other people perceived it. The other night we were eating ice cream in bed and watching the Olympics. “Do you want to hear something sexist or uh, racist or whatever?” Waylon asked during the commercial break. “Some people call this ‘sissy fighting,’” he said, flapping his arms in his usual way. “Who says that?” Katy and I asked in instant unison. “It’s a stereotype that men who move their arms like that are gay,” Katy said. “I know that,” Waylon said, as if my labels were belaboring the obvious. That was it, end of conversation, he was ready to turn back to the TV. I snuggled next to him, my mind a swirl of conflicting emotions. It’s painful to watch your child bump up against the world’s negative judgments. Whether or not Waylon keeps flapping, I know he’ll never be as free as he was before, and I resent it. But I feel hopeful too, because he didn’t seem ashamed. The way he framed it, the problem was other people’s bias, not the angle of his wrist. Maybe he’ll live to flap another day. SHARING IS CARING! Please share your thoughts in the comments below, and share your favorite posts via the buttons below. I’ve been a lurker for a long time. First comment. It’s totally painful to watch your child (my son is 11) bump up against the world’s negative judgments. I love your definition of people’s ideas of how boys are supposed to act. Sometimes I wonder how to phrase things to my son, so he is supported while understanding that others may have (okay, so totally have) a different view on the world. Sounds like you handled it a good way–he snuggled back up to you appearing as though nothing was wrong/different/etc. AND he brought it up in the first place. Which is awesome. Hi Angie! It’s good to hear from someone who has the same experiences! I often feel like I can’t find the right words to say, especially when something pushes my buttons. The good thing about parenting is that I usually get a chance to come back to the same conversation again later. What a tough moment for parents, and a tough period for a child. It sounds as if you are both giving him plenty of space to deal with it in his own way. He should be able to find himself, as he grows. That sounds suspiciously like my nephew’s preschool in Austin…could it be Habibi’s? I liked to call it Chaos Preschool (clearly my bias), but our little guy came out of there (I think he’s in 1st grade now) w/ different ideas of gender norms. This summer he came to spend a week w/ us & go to Sports Camp & one day gave my partner a ‘lecture’ about gender specificity in life: ‘some people say only girls can like certain colors, but that’s not true. And there aren’t any activities just for boys or girls either, like girls can play sports & boys can like pink & purple’.